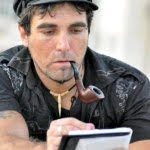 today, our good friend vittorio arrigoni from north italy was killed in gaza. according to news reports, he was abducted yesterday by a militant islamist group. soon after the abduction, he was awfully killed. we have known vittorio for many years and collaborated with him in north lebanon and italy. vittorio was an inspiring person with seemingly unlimited energy and motivation. we're shocked and sad. may our brother rest in peace.